Who has the time to see 75 acts and 200 world-class performers of Jewish music? Who has time to choose from six days of events? Please let us know what you think of my choices and why. I’m not an authority on the subject. Send us your opinion on “Leave a Comment” at the end of this post. I’m aiming for the following free events at Harbourfront Centre mainly because of their multiculturalism. 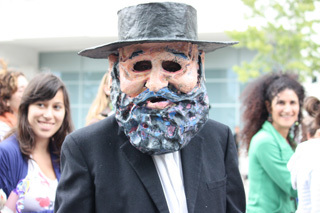 I am also fond of melancholy but lively Jewish music. These are not the only ones in this category, but the ones that fit my schedule. I’d love to listen to some lectures on the subject too. The quotes are from Harbourfront’s web-site. 4pm. 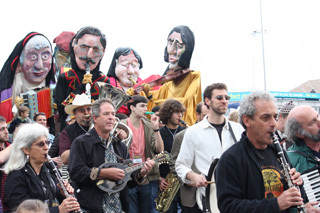 Ashkenaz Parade: Two year’s ago at my first Ashkenaz Festival, I didn’t know what to expect. I only saw the parade, which was a lot more fun than I expected of what I thought would be a religious event. Giant puppets followed the musicians and their vivacious music. I highly recommend it and look forward to seeing the creativity in this year’s parade. You might have other interests, so please scroll through the dates on Harbourfront’s “What’s on Today” schedule as well. Click on the days you are available to go. It’s at: http://bit.ly/AxF0u . 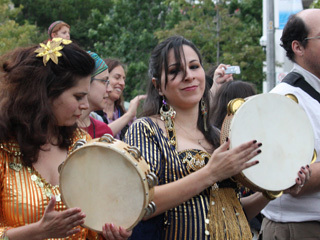 For a list of performers: www.ashkenazfestival.com .